When plates are filled with hot, steaming food, protect tabletops with these handy hot pads. 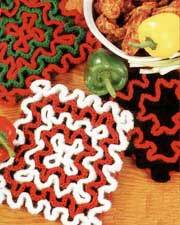 Fast and fun, the hot pads are crocheted in rug yarn for thick, heat-proof protection. Chain (ch) 38 stitches (sts) with Color A to make the base of hot pad. 1 dc in 8th ch from hook * ch 2 —skip 2 chs— double crochet (dc) in next stitch (st). * Repeat across the row, ch 5 and turn. 1 dc in dc, ch 2, dc in next dc across, ending with ch 2, 1 dc in 3rd ch of turning ch. Repeat last row 9 more times. When you have 11 meshes each way, yarn and tie off. With color B, begin at center and work around following pattern on diagram, working from right to left, tie in yarn, ch 3, 2 dc in same space. Work 3 dc in each ch-2 space around, join with a slip stitch in top of ch 3, cut yarn. Tie in color A and repeat around working from center to outer rows. Alternate colors A and B as shown in diagram.